Welcome to Blockhouse Bay Primary School. I feel privileged to be Principal and proud to be part of the on-going success that the school has always been famous for. Blockhouse Bay Primary is my fourth Principal's position, with stints at Waikino, Mangawhai Beach and Woodhill making up over 20 years as a Principal. Previous to that, I taught my own class in Waihi and South Auckland schools for a total of 10 years. My philosophy on schooling is that it is our responsibility to educate the whole child. Reading, Writing and Mathematics are very important and the children at Blockhouse Bay Primary School do particularly well in these areas. However, our role of preparing children for life is as important as preparing them for making a living. Aspects of the curriculum such as the arts (including performing arts), physical education (including fitness and sport), health, science and social studies are critical for providing children with the skills to live in the real world. Children learn best when they enjoy being at school and providing a range of learning contexts and opportunities is something that we always strive for. Our goal is to produce outstanding young people who will be confident life-long learners and will have the skills to reach their potential. The staff are enthusiastic about providing the best possible learning environment and enjoy working with parents and children to achieve this. We encourage all parents to be actively engaged in all aspects of school life. This ranges from being aware of how to help your child's education, to helping at our fundraising events run by the enthusiastic team that make up the school's Parent Teacher Association. I am one of the lucky people who enjoy their job and can't wait to get to work each morning. My main professional goal is to create the conditions that allow our talented teaching team to operate at the highest possible level, ultimately delivering an outstanding primary school education to our children. I am proud of our school and the wonderful learning that is happening here. I look forward to working with you all to create the educational environment that our children deserve. ‘He Manu Rere’ is our Graduate Profile. We talked with students, parents, whānau and staff to find out what were the important attributes our community wanted to see in a Blockhouse Bay School graduate. The result is ‘He Manu Rere’, which means ‘A Soaring Bird’, linked to the tui on our school logo. The attributes identified by our Community have been grouped under the titles ‘Know me’, 'Know Others’ and ‘Know How’. 'Know me' is about every learner being secure in who they are, what is special about them and the people important to them. 'Know others' is concerned with understanding our place and responsibility as community members. 'Know how' is about the essential characteristics needed to learn and flourish in our constantly changing world. 'He Manu Rere' provides guidance for all of our Blockhouse Bay Learning Community and is is our goal to partner with parents, whānau and the community for every learner to leave our school with strong sense of 'Know Me', 'Know Others' and Know How'. 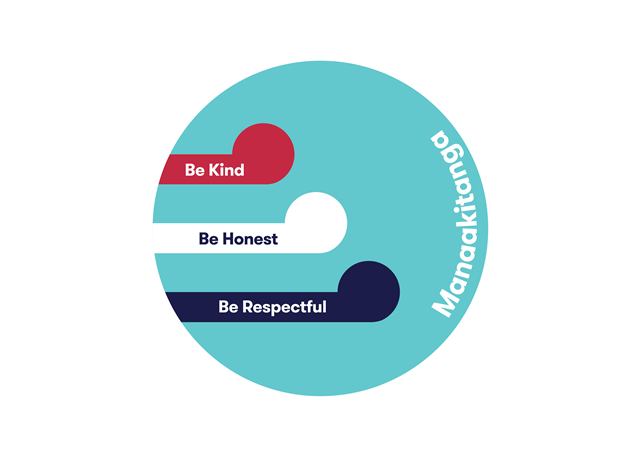 'Manaakitanga- Be Kind, Be Honest, Be Respectful' provides a framework for supporting positive behaviour and well-being at Blockhouse Bay School. 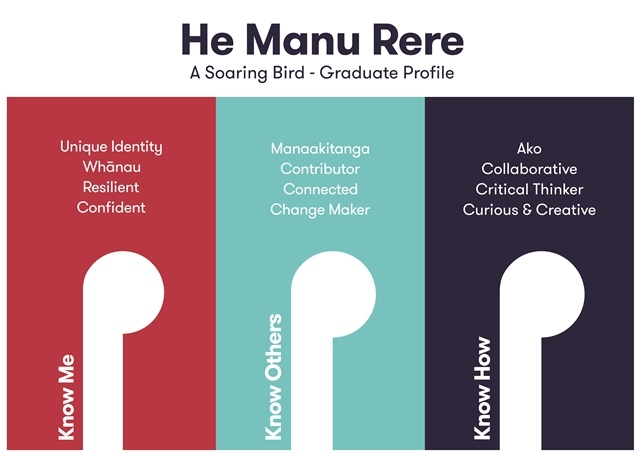 Manaakitanga is one of the attributes identified in 'He Manu Rere', our Graduate Profile. Students and teachers use Manaakitanga to reflect on their actions, take responsibility for them and make positive changes if needed. At Blockhouse Bay School, the New Zealand National Curriculum is presented to our learners through an inquiry based approach. Curiosity and wonder starts a learning journey to enable learners to seek knowledge, ask questions, find out, understand, ask 'what now?' and reflect. Learners will explore the areas of Science, Technology, Social Science, The Arts and Health and Physical Education within the overall concepts in 2019 of 'Look to the Future; Tinkering leads to Curiosity and Creativity' and 'Kaitiakitanga: Community Action'. Teachers will use these overall concepts to help children to understand and learn about their world while exploring the Key Competencies of the New Zealand Curriculum. We aim to hook students into learning through authentic, engaging contexts which are learner centred and teacher guided. Learning to read and write well and developing mathematical skills are at the heart of learning at our school and provide access to all other learning. We endeavour to help our students develop a 'Growth Mindset'. This principle is woven through all teaching and learning at our school. It focuses on teaching children to 'learn how to learn'. We teach children to persevere and show resilience when faced with challenges and difficulties. This allows them to work on getting better, improving and learning from failures along the way. Our goal is that they will seek, strive and soar throughout their years at Blockhouse Bay Primary School. At Blockhouse Bay Primary School we cast a spotlight on the richness of our wonderfully diverse community. Community celebrations are at the heart of this and each year we gather to share such events as Matariki, Chinese New Year and Diwali. Supported by the wider community, our School Carnival in December celebrates, respects and acknowledges all cultures. Our school productions are legendary with standing room only at all performances. Acting, singing and dancing talents are showcased to a very high standard. Our Art Show is a biennial event. Student, teachers, whānau and community look forward to these occasions. The best of student's art is presented in a gallery setting and the range of exhibits is outstanding. Book Week, another biennial community event, includes costume parades, special guests, book launches, a book fair, reading by torchlight and of course lots and lots of reading. Sport provides a wealth of opportunities for our community to gather. Whether it is Interschool Field Days, Athletics Days, Cross Country, Swimming Carnival or Gymnastics, our community gathers to support and celebrate the effort, sportsmanship and achievement of our students! The Blockhouse Bay Primary School Board of Trustees operates to reflect the goals and aspirations identified for the benefit of our learners. We do this by listening to the community, reviewing results achieved and through the requirements of government policy. The Board sets the overall direction of the school, policies, plans, goals and budgets, then we review our results against these policies. Our Strategic Plan can be found below. The board is not involved in the day to day management or operation of the school as this is the responsibility of the Principal and staff under delegated responsibility. Board meetings are open to the public and members of the school community are always welcome. Board members can be contacted via the school office. Our staff bring a wealth of knowledge, experience and enthusiasm to help our learners experience the very best our school can offer. Using their diverse skills and interests, teachers collaborate to create programmes and experiences which will excite and motivate learners. Our experienced support staff ensure the smooth running of the school and are always available to help with any questions or concerns. Open the attached list to view our team members. To send us an email, click on the team members name. ERO reviews schools and early childhood education services, and publishes national reports on current education practice.